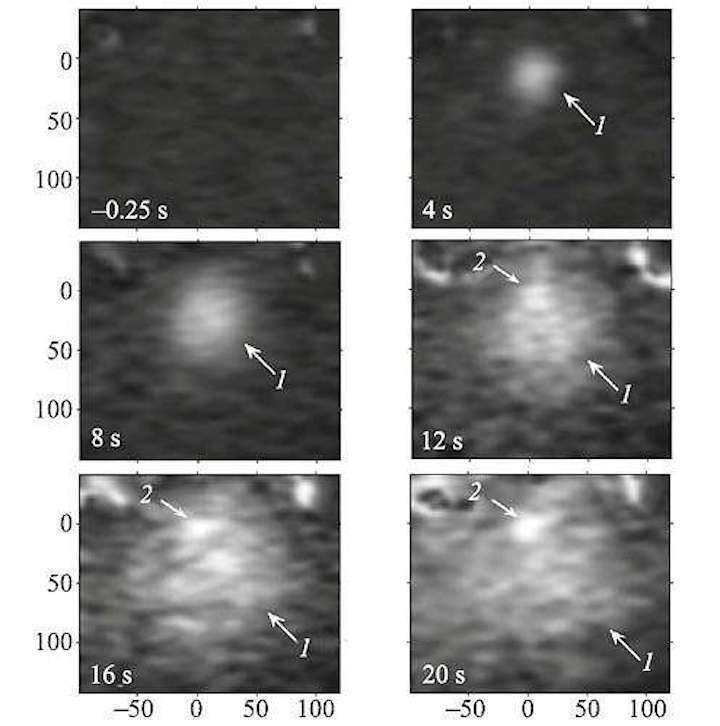 Photographs of the region where the meteoroid collides at the point (0, 0) with the surface of the Moon taken at 0.25 s before the collision and at 4, 8, 12, 16, and 20 s after the collision. The axes present distances in kilometers. Arrows 1 and 2 indicate the fast large and slow small dust clouds, respectively. The collision of a meteoroid with the surface of the Moon greatly changes the properties of the surrounding dusty plasma system by throwing a large quantity of lunar soil-regolith debris - dust particles measuring 10-100 microns - into the otherwise relatively unsullied exosphere. Russian researchers from the Higher School of Economics, Space Research Institute (IKI), Moscow Institute of Physics and Technology, Sternberg Astronomical Institute, and Far Eastern Federal University determined that a meteoroid's collision with the surface of the Moon produces a shock wave that throws up regolith fragments and droplets of molten material into the surrounding free space. Those fragments and hardened molten droplets rise above the surface of the Moon, interact with the electrons in the solar wind and solar radiation and take on an electrical charge. Two dusty plasma clouds form as a result - one composed of regolith fragments and a second of hardened droplets of molten material. The differing characteristics of the two clouds make it possible to observe them separately. Scientists have calculated the main characteristics of the clouds - the speed at which they expand, the size, number density, and electrical charge of the particles in each, and so on. The calculations and observational data matched. It was found that a cloud formed by hardened droplets of molten material expands significantly faster than a cloud formed by regolith fragments. 'Lunar dust is a significant risk factor for spacecraft, equipment, and the astronauts' health,' explained study co-author, HSE Faculty of Physics Professor, and Space Research Institute Laboratory Head Sergey Popel.